Dutch jurist; born at The Hague Nov. 3, 1860. He studied law at the University of Leyden (J.U.D. 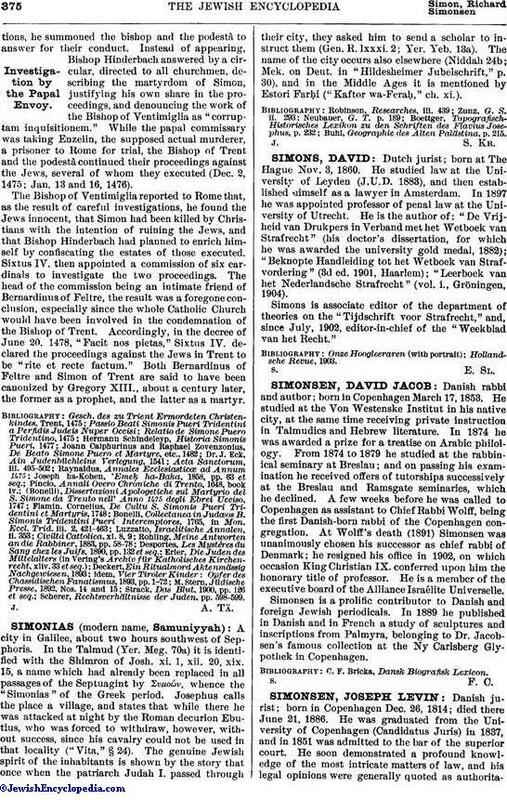 1883), and then established himself as a lawyer in Amsterdam. In 1897 he was appointed professor of penal law at the University of Utrecht. He is the author of: "De Vrijheid van Drukpers in Verband met het Wetboek van Strafrecht" (his doctor's dissertation, for which he was awarded the university gold medal, 1882); "Beknopte Handleiding tot het Wetboek van Strafvordering" (3d ed. 1901, Haarlem); "Leerboek van het Nederlandsche Strafrecht" (vol. i., Gröningen, 1904). Simons is associate editor of the department of theories on the "Tijdschrift voor Strafrecht," and, since July, 1902, editor-in-chief of the "Weekblad van het Recht."